» French legislation is crap, it doesn’t stop bullets ! French legislation is crap, it doesn’t stop bullets ! 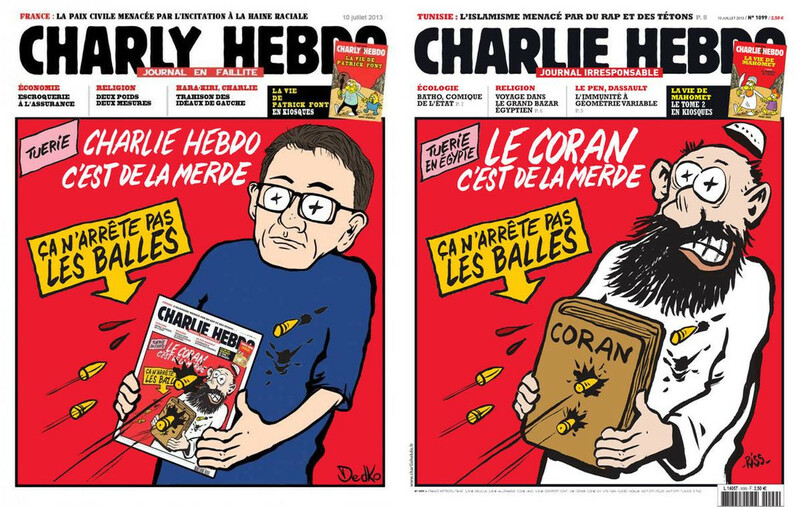 This drawings say ‘The Coran/Charlie Hebdo is crap: it doesn’t stop bullets !’ – a 16 year old in Nantes has been arrested for publishing the one on the left with the comment ‘ironic’. The drawing on the right is the actual Charlie Hebdo cover it satirizes. I also find that the caricature is indeed ironic – I even laughed when it was published hours after the massacre. So here it is, published on my account – now arrest me: those twin pictures are a wonderful opportunity to explain that freedom of speech must apply equally to all. Streisand me !